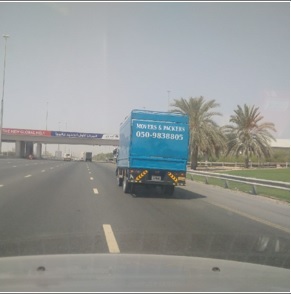 Truck Drivers offering illegal Home Shifting Services are on the rise and it is now common to see on the UAE roads, Trucks which are licensed only to offer Transportation services, carrying signage and vehicle graphs stating as “Movers and Packers” or “ To Call for Home Shifting”. Removals and Relocation Services are legally offered only by Licensed Removals & Relocation Companies or Logistics Companies whose are licensed to offer these services as well. According to C.C. Niyaz Ali, Managing Director of DULOG, these Truck Drivers are misleading the general public and in the event of any claims, accidents or crimes including missing items, the affected customer is in a disadvantageous position as technically he or she had resorted to using the services of unlicensed operators and is then exposed to its natural consequences. “We have heard of cases where the job is won quoting very low price but once they start the job, at the middle of the move, they will start arguing with the customer related to the scope of the work and about exclusions and start demanding for additional amounts, putting the customer is a helpless situation but to concede to their demands” said Mr. Ali. He said recently there was another case reported to him by a customer who refused to give the job to DULOG stating that he had received a far lower Quotation from another service provider but few days later he called again and informed that many of his furniture items were damaged during the dismantling and re-assembling processes as the Labour which the Truck Drivers arrange were all illegal workers, absconders from their original sponsors etc., who are mainly loaders and not professional packers or carpenters. DULOG has a full-fledged Removals and Relocations Division with its own fleet of covered vehicles, own staff who are well trained in furniture and fragile items handling and packing, dismantling of any type of most sophisticated furniture and re-assembling of the same after the move at its new Destination address. The Company is also one of the leading providers of Storage and Self-Storage Service providers in the UAE offering both Air-Conditioned and Non Air-Conditioned Storage units . Local Shifting services and Office relocation Services is best offers provider for transportation.